Well today after work was certainly a banner day. I arrived home to find this sitting on the floor inside the door. So from what I am reading on the box, this is just the Core game which had a crap-load of add-on's & a reward box. This means more will be coming down the road....but to finally have this in my home. WOOT! Inside the carton were 2 boxes. The big core box & the reward box. It seems even Adam was over excited getting this to us....hence the typo thanking us. I had to see inside, so away with the plastic wrap. & here is the gameboard. Very thick card & very nice indeed. Lots of cards & built in storage trays....nice! The image below are the miniatures in the Survivor level rewards. Also my Infamy - Big Smoke kickstarter arrived....I need an early retirement at this rate. This game has some beautiful miniatures. The exchange rate however on the poor Canadian dollar prevented me from going bigger on this. I may look into getting the others down the road. The remainder of the photos below are close-ups of each of these models. This will be the last I see of these for the near future as I have a few more figures to get painted before Fallcon. As well a couple of the fella's will be coming over to playtest the scenario of All's Quiet on the Martian Front that Scott & I will be hosting there. It's going to be hard to focus with all these shiny new miniatures around the house. Another busy & fun weekend is drawing to a close. Yesterday my wife & I attended the Edmonton Comic Expo where I actually dressed for the occasion. It was a long day filled with amazing cosplayers & costumed folks all enjoying a day with like-minded individuals. This is I believe the 8th year for Edmonton hosting this? 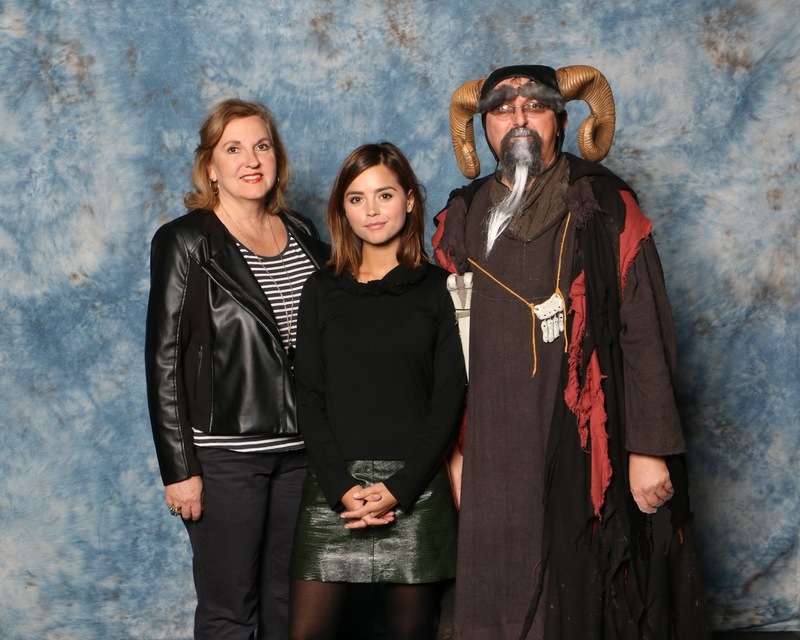 We are starting to see some big names such as Stan Lee, Jenna Coleman & others. So whom did I dress as? Why non-other than Tim the Enchanter. Not sure who this lass was, but she certainly got my attention. Tim seems to have found himself in a Galaxy Far Far Away. There were quite a few Star Wars themed costumes. This lovely lady was very excited with seeing Tim. How could I say no? There was also a large number of ladies dressed as Harley Quinn. This one seemed the best as she started an impromptu performance & was having a lot of fun with the it. This year we took in a couple photo-ops. Jenna Coleman! WOOT! I didn't realize she was so petite. We were in the third batch of attendees & they were really rushing to get everyone through, so we could barely say hi....lesson learned, try to be in the first batch of people going forward. As well we had a photo with the Cosplay folks. I think Tim found a new Rabbit, YAY Jessica Nigri! So after the excitement of the expo, I got to open a couple parcels which had arrived. First was a parcel of some mdf kits I had ordered from Blotz. I am always looking for smaller scatter terrain pieces & these will fit nicely in a couple of era's for gaming. I also had a couple ziplock bags of produce in sacks. I've already tested them on the cart & they fit wonderfully. More photos when they are done. As well they had some Gypsy Caravan's. YES had to have a couple of those! The other parcel was from my Darksword Diterlizzi Kickstarter. I got the core set & a couple of the add-ons, but not the whole affair. These will work well with my sudden Frostgrave Craze. So there is the end of another busy, fun weekend...at this rate I will need a weekend from my weekends. At least we have a couple weeks before Fallcon so I can relax a bit from the rush. This morning saw the matte spray hit the miniatures I completed yesterday. So up first we have Nick from Zombicide, Mind if we call him Bruce to save on confusion? As well as his Zombivore Variant. His base will now receive some love as I add rubble & perhaps the latest Swimsuit Issue of Sports Illustrated. As well I finished Boba-Fett from Imperial Assault. I am sure I am not alone with my anti-hero admiration for this character. I just know somewhere in his equipment was some ant-acid to get him out of that gullet. Not sure if I will get any painting done this weekend, as its the Edmonton Comic Expo, which I am actually dressing up for this year! YAY! Perhaps next year I can talk the wife into joining the shenanigans. I seem to forget every September how busy my weekends are. This one being no exception as we spent a couple hours at the Model Train Show, which occurs every September. I was sad to see one of my favorite exhibits wasn't present this year. I know the fellow who was building it seemed to think that last year would be his last, as his health was starting to fail. I just hope his is doing well, & although not exhibiting, is getting to the show. I didn't take many photos of the various layouts, as many have been seen before, there are just tweaks & updates as this hobby continues to grow. I find myself often captivated looking at the work these people do on their layouts. Terrain Kickstarter I am part of now would fill this nicely. My search however still continues to find a gutted O gauge locomotive & some rail cars for a decent price for some pulp gaming. Oh well, there is always next September. We managed to make it away from that previous gauntlet & found ourselves at a gated development. With 3 large building blocks. We are even finding some vehicles, though we will need Gas to get them going. Wanda skated over & opened the first building, we quickly found the old inhabitants. As well an A-Bomb-ination had spawned & was making its way towards us. Luckily the party had found a bottle & a can of gasoline, so quickly prepared a molotov. We then back-tracked to clear a path so Ned could lob the zone clearing device onto it. Then they got stuck in & separated from the others. The Skinner Walkers then got a free move which was the death of both survivors. Two Zombivores are created. As well the remaining 4 survivors had also taken wounds from this skinner action. Thus ended the campaign during the third chapter, as all Survivors were swallowed by the hordes of Zombies. So at this point we will likely shelve the campaign for a bit, which will allow me to get more of the miniatures painted. 1) A couple of the players dislike the free actions given to zombies of a type when the pool of them runs dry & their card is drawn. Personally I like this rule. It will not likely happen with the original Zombies as I have a second complete set due to the Kickstarter. 2) We had 2 players sitting over red, a couple even got to double red & were garnering all sorts of skills. For the first while until some of the move again cards came out, the players seemed untouchable. So it was good to see that even those you think may be invincible can fall. 3) As this was intended to be a long campaign, I allowed each player 5 wounds vs 2. Is this too much? Should I make it that those who get past each tier of red gain another wound for next time? 4) I started the campaign with the Berserkers, Toxic, Crows & Zombie Dogs. Should I set these to trigger entry into the campaign by the attaining of red tiers of survivors? 5) The scenarios were taking a long time to play. Our typical club night is roughly 2 hours before people start looking at the clock. Perhaps as Chen suggested, taking a photo of situations, but those could be very cumbersome to try to reset them to where they left off. If it was at my house, then it wouldn't be an issue. Something to dwell on. I've also thought about using the objectives more to assist in finding particular items like scenario 1 needing the rice, water & other item, perhaps using different coloured objectives on the underside that drop one of the required items.